You can quickly and easily add, remove or modify items in your watchlist. Don’t forget those investing ideas you read about. Add them to a watchlist! There are several ways to add an item to a Watchlist. 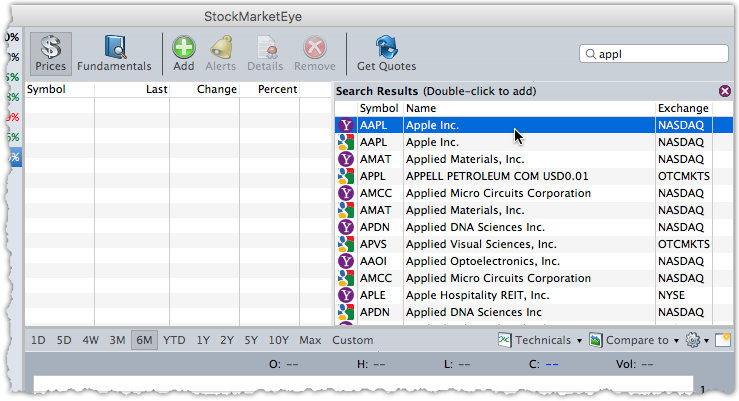 “Symbol Search” In the upper right corner of the StockMarketEye window you will see the “Symbol Search” field. Click in the field and type the name of a company, product or symbol. The search results area will appear. You can add one of the search results to your Watchlist by double clicking it. 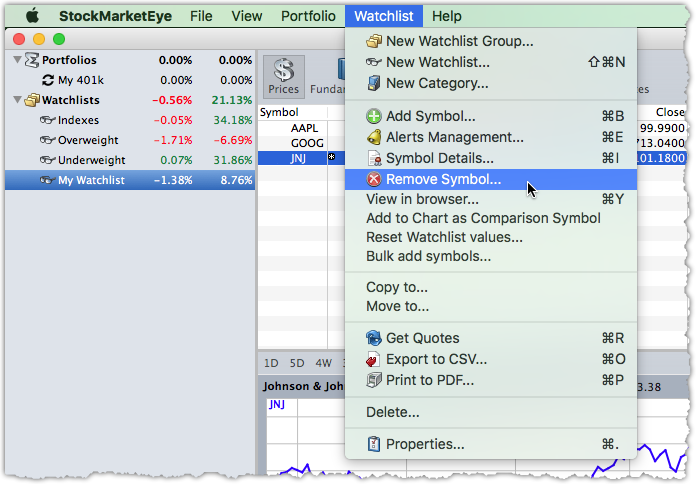 Alternatively, you can drag-and-drop it onto one of the Watchlist names in the Folders area on the left side of the StockMarketEye window. You can read more about searching for ticker symbols here. 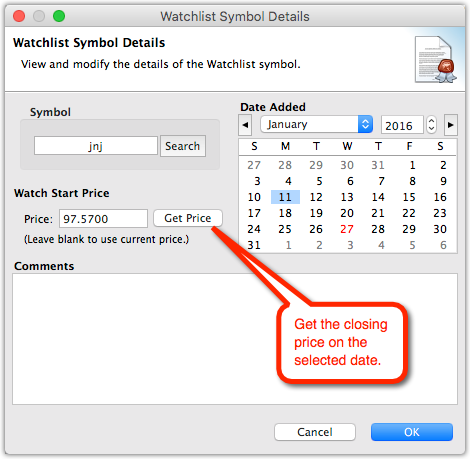 You can also click on the “Add” button in the Watchlist toolbar to open the “Watchlist Symbol Details” window. This window allows you to specify the details of the symbol you are adding to your Watchlist, including its watch price and date. 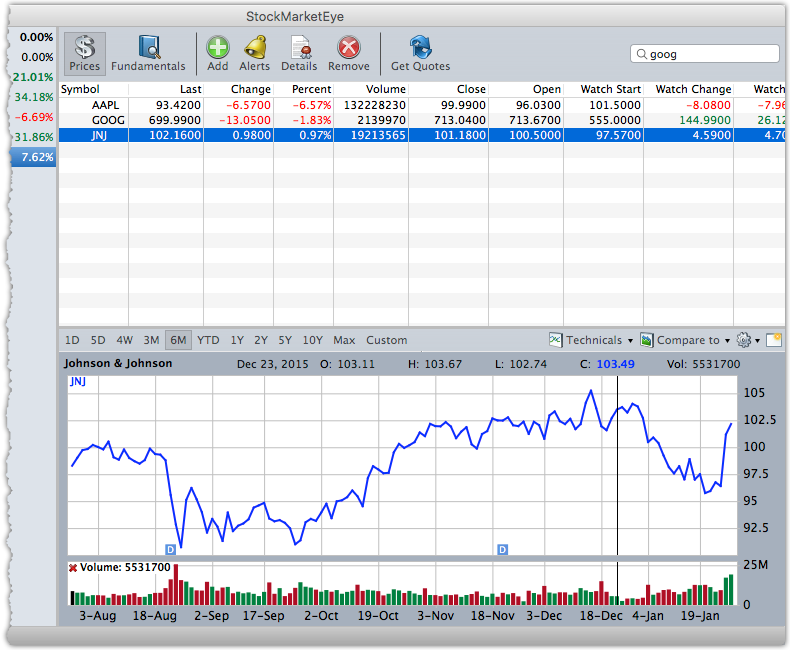 In the Symbol field, type the stock symbol (or stock ticker) that you are interested in. The defaults for the other fields are usually fine, but you may wish to add a comment about this stock in the Comments field. When you have finished, click the “OK” button and your stock will be added to the Watchlist. After you have added your stock symbol, your window will look similar to this. Note: If you received the message “Sorry. We were not able to find any information about the symbol, ‘XYZ’”, it may be an indication that need to set your proxy server. See the Setting A Proxy Server section for details. You can modify an item in your watchlist in several ways. Double-click - Double click on the item in your watchlist to open its details window. Toolbar Details Button - Select the item in you watchlist and click on the “Details” button in the toolbar. Direct Edit - Select the item in your watchlist and then click in the cell you would like to change. Not all cells are editable, but important ones such as “Last” and “Watch Start” are. An asterisk in the corner of the cell means that the value in that cell has been manually set and is not updated by StockMarketEye. You can remove an item in your watchlist by selecting the item, then using the main menu, Watchlist -> Remove Symbol. You will have to confirm that you want to delete the item by clicking OK in the confirmation box.